Once again it is time for an update of vScope. The first, and most obvious thing you will notice, is the redesigned version of Table Explorer but there are also a lot of other things that are included in this release. Table Explorer is the most frequently used tool in vScope. It’s a cornerstone for analysis and exploration of the data in vScope. We have upgraded the user interface to make it as simple as possible to get started exploring your IT. Sometimes you quickly want to share your table of all the findings that you have discovered. This can be done via “Share Snapshot”. 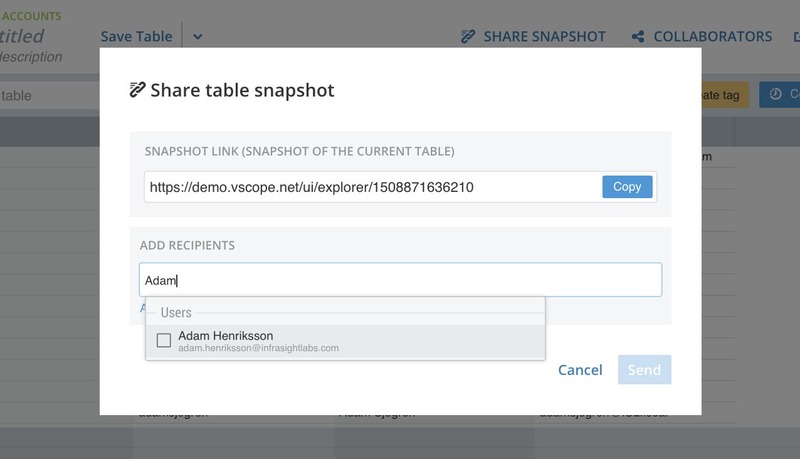 Sharing a snapshot will provide a link that leads to an exact copy of the table that your are looking at. 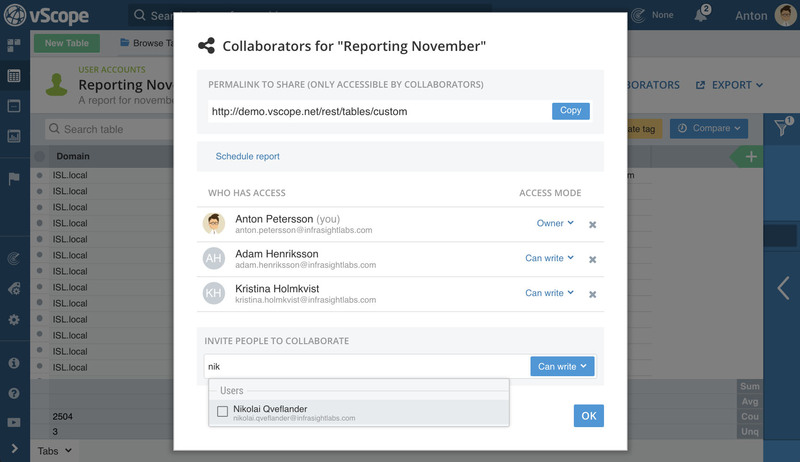 With the new “Collaboration” feature, you will now have full control of who can read and edit (write) your tables. vScope 3.1.0 includes a new resource type for all monitors connected to physical machines. Use vScope for a quick way to take inventory of all the monitors at your place. vScope Limited allows any organization to download and try vScope by themselves. We made sure to make the initial setup of vScope much easier, without our presence during the installation. So, go get started with vScopeing! For any questions occurs, online support are always available to help. The support for Azure AD is bundled but needs to be toggled on by us at InfraSight Labs. Please contact us either via the chat widget on this page or by sending us a message. A first step towards integrating vScope to other systems is to create an API token. Maybe you have read our blog post about getting data out from vScope using a token. With the new API token manager, located in the settings page, you can much easier manage these tokens. Better adoption of design elements when collapsing/expanding the sidebar.